The Purple People Eaters was the nickname of the Minnesota Vikings football team's defensive line of the late 1960s to the late 1970s, when the Vikings played in four Super Bowls. The Purple People Eaters are Alan Page (9 Pro Bowl Selections, NFL MVP, and Hall of Famer), Carl Eller (6 Pro Bowl Selections and Hall of Famer), Jim Marshall (2 Pro Bowl Selections), and Gary Larsen (2 Pro Bowl Selections) The Purple People Eaters were a big factor in the post-season success of the Vikings from the late 1960s through the 1970s. 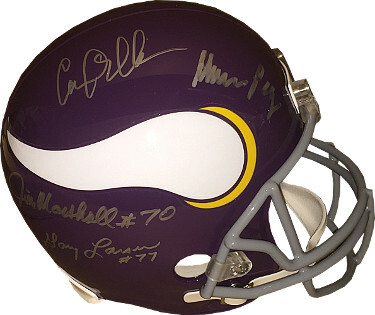 This Minnesota Vikings Full Size Throwback Replica Helmet was hand signed by the Purple People Eaters: Carl Eller, Alan Page, Jim Marshall, and Gary Larsen. JSA Hologram #V92531 and Certificate of Authenticity.